Set in the vibrant coastal town of Aci Trezza, Sicily La Terra Trema a.k.a The Earth Trembles (1948) tells the story of a small fishing community in the wake of a significant social strife. Directed by legendary director Luchino Visconti (Rocco and His Brothers) the work is regarded as a masterpiece of Italian Neorealism. The main character in La Terra Trema is Ntoni Valastro (Antonio Arcidiacono), a frustrated fisherman, whose life quickly spins out of control when he decides to oppose the unfair trade rules imposed by the local wholesalers. The young man is angered by the fact that hordes of fishermen must sell their daily catch for pennies while speculators pocket outstanding profits. Ntoni quickly convinces his large family that if they mortgage their home and manage business together life will be better. In theory Ntoni's plan sounds exceptional, in reality it quickly collapses with a bang. After the family contracts their house through a local bank and receives a sizeable amount of money nature turns against them and eventually they are faced with an impossible dilemma. Shot entirely with non-professional actors speaking a difficult to decipher native dialect La Terra Trema is a work filled with political overtones. From the heavy criticism of exploitation, emphasis on solidarity, and insinuations about inevitable revolutionary action Visconti's film is charged with so much anger that often the lines of the actors feel like unedited leftist slogans. 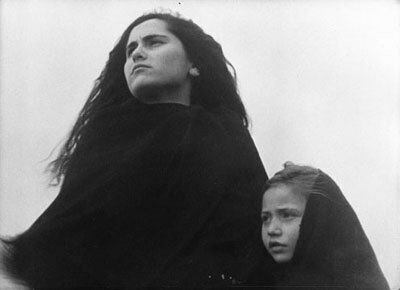 In fact, all of the criticism La Terra Trema has gathered during the years has to do precisely with the fact that its political agenda visibly disturbs the film's natural rhythm. A credible enough argument? Perhaps! Regardless of whether or not we agree on such take of La Terra Trema it is an undisputed fact that the film did indeed have a tremendous impact amongst Italian politicians. Its nomination for Golden Lion at the Venice International Film Festival was preceded by passionate discussions reaching far beyond cinematic circles. In America, coincidentally or not, the film was almost impossible to see! 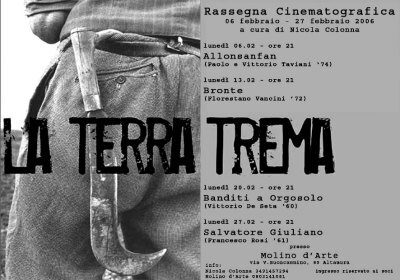 Put aside all of the controversy surrounding La Terra Trema, however, and what is left is an incredibly mature portrait of a community mirroring the Italian state with an impressive accuracy. The sharp division between workers, symbolizing the left, and wholesalers, symbolizing the right, is suggestive to say the least. The scattered writings throughout the streets of Aci Trezza announcing that "Communists are everywhere" and "Dedicated to the People" (the Duce's aphorism) further enhance the feeling of a country torn by political prejudice. Perhaps the most unusual aspect of La Terra Trema however remains its narration. Assisted by Antonio Pietrangeli (La Visita) who added a voice-over commentary due to the fact that none of the "actors" spoke Italian Visconti delivered one final jab at his critics boldly announcing that "Italian is not the language of the poor". The political resonance was enormous casting a heavy shadow over the persona of one of Italy's most important film directors. Together with Ossessione and Antonioni's Il Grido and La Notte I think it is fair to say that La Terra Trema is one of the few films fans of Italian cinema have been praying to surface with a deserving transfer! The previous R1 releases by Image as well as every other English-friendly disc available on the overseas markets have been of such horrendous quality that I certainly wondered if a proper version will be made possible. Fortunately enough top Italian distrib Ripley Home Video-RHV, the same production company that delivered the spectacular release of Bernardo Bertolucci's Prima della Revoluzione a.k.a Before the Revolution, have once again stepped up and the result is, well, you guessed it: pure perfection!! Without making this a bigger deal than what it is I must say that indeed the restoration work on this disc will cause a lot of head-scratching. Presented in its original aspect ratio of 1.33:1 La Terra Trema has been given an outstanding treatment. The freshly-restored print (from what I understand there was heavy Cinecitta involvement) has a remarkable degree of contrast, lush and solid blacks and whites, and a look that at times is almost impossible to believe is that of a 60-year old film!! Debris, scratches, and specs have been digitally removed and as far as I am concerned the state of this film can not be bettered by any further restoration work. Plain and simple! This is an outstanding effort by RHV! I am not sure what else could be said about this print without sounding like a broken record which keeps playing the same tune. If you have seen what RHV did with Before the Revolution then you already know what to expect! PAL-encoded, Region-2. Presented with its original Sicilian dialect-Italian mono track the film sounds just as impressive as it looks. Dialog is easy to follow (that is if you understand the dialect spoken here) and sound is crystal clear. I could not detect any imperfections with the audio whatsoever and all I could say is that indeed RHV have my utmost admiration. The film comes with optional English, Italian, and French subtitles. The main feature plus a filmography for Luchino Visconti. From what I understand there have been some sizeable changes in RHV and while I don't have any substantial facts to prove whether or not these reflect the company's recent efforts to provide English subtitles on their discs (we will have reviews for the recent RHV-distributed Il Generale dell'armata Morta by Luciano Tovoli, Un Caso d'incoscienza by Emidio Greco, and Gli Sbandati by Francesco Maselli among others shortly) I am very, very excited. So far La Terra Trema is one of the great surprises of this year and I could not be any happier. Such marvelous efforts here at TALK we award with the highest possible mark: DVDTALK Collector Series! !